Drinking traditional lambic always seems to result in me saying “I’d like to brew one of these some day.” The complicated turbid mash and the very long aging have kept me from actually trying. After reading Jeff Sparrow’s book Wild Brews: Culture and Craftsmanship in the Belgian Tradition I couldn’t put it off any longer. I finally broke down and brewed one. To brew a lambic you have to change the way you think about brewing. Just about every part of the process violates a common brewing rule. The grist is typically made up of a large amount of unmalted grain – usually about 30% unmalted wheat. The idea behind this is the unmalted grain will leave unconverted starches in your beer, which the microorganisms (namely, Brettanomyces) will survive on throughout the long aging process. The mash schedule commonly used breaks down proteins to ensure you get that large amount of starch from the wheat. 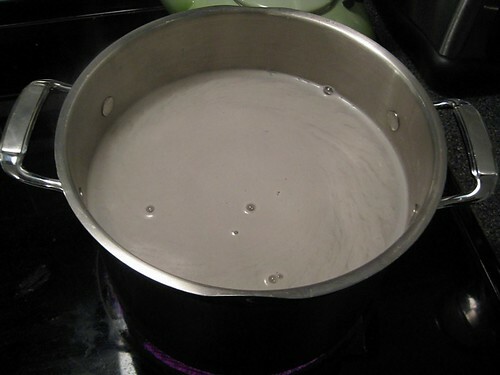 Sparge water is typically near boiling, with little concern about stripping tannins off of the grain. Hops are only used for preservatives and should be low-alpha and aged (never fresh). Finally, lambics are intentionally inoculated with the very same microorganisms we typically work so hard to keep out. Then the waiting begins.. at least a year for an unblended lambic and up to three years for a gueuze. Dough in @ 86 with 3 gallons of water. Collect about 1.5 gallons wort and bring that to a boil. Meanwhile, dough in again with another 3 gallons to get mash up to 113 ( I added 118 degree water, based on calculation from this site. Hit it spot on.) Rest 15 minutes. Bring up to 122 and rest for another 15 minutes. Add boiling wort back to mash to bring up to 149. Rest for 45 minutes. Here, I’ve read you should bring the mash up to 158 for another 30 minutes. I actually ended up higher in the previous step (154), so I just kept it at that temp for an hour. Collect wort, then sparge with 4.5 gallons of 190 degree water. I had outstanding efficiency (89%) and ended up with about 7.5 gallons of wort. Boiled for 30 minutes, added the hops, then boiled for another 75 minutes. Chilled to 65, transfered about 5 gallons to a glass carboy and pitched yeast. 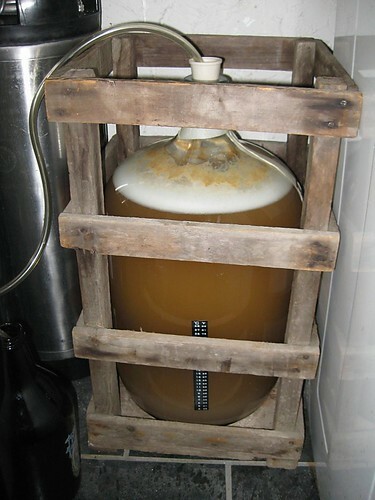 It took about two days to show any signs of life, but once it got going a healthy fermentation has been going strong. It’s been fermenting between 66 and 68 for the past two weeks. A film called a pellicle should form soon,which will protect the beer from oxygen/mold as the brett eats through the rest of the dextrins and starches. I will probably bottle a few after a year and keep the rest going for the next two years to blend into a gueuze. Hoping to make the fall lambic an annual tradition.